The Jewish Apostle Peter explains that people praised God that a man above 40 had been healed. Enoch was the first man who was “taken by God”. But first he had to walk with God for 300 years. Enoch walked with God for 300 years. Than God took him away. Your walk will surely be much shorter. After further threats they let them go. They could not decide how to punish them, because all the people were praising God for what had happened. For the man who was miraculously healed was over forty years old. To be above 40 and a believer of Jesus was quit an age. Because in the first days of Christianity, the faithful were martyred like their Master by a violent and wicked generation. Adam had to live on Earth for 930 years. After being banished from the Garden of Eden, this life was surely full of misery and pain. Since the Earth was full of violence and wickedness, Adams life must have been like a horror show. We do not know the final judgement of Adam. The Bible is silent on this topic. Outside of Noah`s family, we can read about a man who was going to be saved by God of the Bible in his present time. That was Enoch. 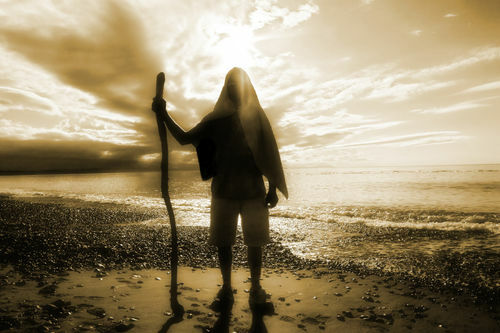 But Enoch had to walk with God for 300 years, before God took him away. In the New testament area, God had already shortened mans life on earth to 120 years. For our own good, I presume. That non of us is able to cross that age limit, is a brilliant proof of the correctness and divinity of the Bible. God is faithful to the written Word. Many men might speak a lot of strange things, and claim they have got some revelations from God most High. But the perfect written Jewish scriptures found in the Bible is the truth. It will never be proven wrong. Since men should no longer walk on Earth more than 120 years, the Jewish Apostles did not have to suffer long on this fallen and wicked Planet Earth. If the purpose of our faith is a long, healthy and prosperous life on Earth, Jesus Him self could have died and resurrected at the age of 90. Jesus did not. He died in his early 30-ties. And only three years into His Ministry on Earth. John the Baptist is another example. The cousin of Jesus was beheaded when the Messiah walked on Earth. We do not know the exact age of the apostle Steven, the day he was stoned to death. But I guess He was a young man, who was stoned to death before the even crossed 30 years of age. Should we than long for, and desire, an early departure from our flesh? Absolutely not. We are in the service of Jesus the Messiah, and He decides our entry point and the time of our departure. We serve Him with peace in our Heart and gladness on Earth, as we will continue to serve Him with gladness in the Kingdom of Heaven. We will walk with Him on Earth as long as it takes. I am torn between the two: I desire to depart and be with Christ, which is better by far, but it is more necessary for you that I remain in the body. A typical sign of an unsaved «Christian», is that He is scared of dying. Because He has not understood that He is saved, and are not sure where he is going. And as Paul explained. «For to me, to live is Christ and to die is gain». Many false Christians teach that the purpose of our faith is a long life in the flesh. They are ruled by many fleshy desires, and have been deceived by the Prince of this World. The purpose of our faith is the salvation of our soul, and eternal life in the Kingdom of Heaven. First published 29th of September 2009. Obama gave him self a AAA. I will rejoice in your A+… Blessings. Praise Yeshua, for giving us assurance all because of His blood. Hallelujah. If that doesn’t make you sing, I don’t know what will. Love casts out all fear…Oh death, where is your sting!! Please explain this. I would like to think both Adam and Eve were saved, as well as their son Abel and …. they believed in the coming Messiah promised in Genesis 3:15. Now were it is written that Enoch was the first man that was saved. Please show me the verse. I might be wrong. The Bible is silent how God judged Adam and Eve. So I have nothing to add. God gave us all the ultimate solution. The Messiah. I have put my trust in Him. Thanks for exposing my error. I will correct the Bible study. I believe you are right. This is the conclusion of God’s first conversation with Satan (the serpent). The woman is the soon to come Israel, and all who have been grafted into the faith of Jacob and his tribes. “He” is in the correct context, The Messiah. These verses says nothing about how God would judged Adam and Eve. They were banished from Eden, and their life must have been miserable, always remembering their transgressions. All the sons and daughters of Adam and Eve died in the flood. Genesis 3:14-15 is not the restoration of Adam and his seeds. God was not pleased with any of them. God regretted creating them. Only Noah and his family was found righteous, and worthy of a new beginning. Noah’s son Shem, is the forefather of Abraham. Canaan was cursed by God, and so was his family tree. God told Joshua to destroy all the Canaanites. Today’s “Arab Palestinians” claims to be the sons and daughters of the Canaanites. My best guess is that they are. The curse of Adam, can only be lifted by the Messiah Jesus. He was there with Abraham, and promised to bless his sons and daughters. The blessings follow the bloodline of Isaac and King David. Jesus was a son of David, from the house of Judah, the Son of Jacob (Israel). It is interesting to read about Job. He also was “bitten in his heel”. But the head of the serpent was crushed at the end of this book also. Father, Son and Spirit has always been there. The Son gave us all the final victory at Calvary. Amen. Because of Calvary, Satan has no power over all who obey the Messiah. But Satan is not yet powerless. He and his children create a lot of problems in the World. Satan is the mastermind of confusion. He and his children’s days of reign will not end before Jesus throws them all in the lake of fire, Hell. And thank you for your biblical replies. I don’t think we should argue if Adam and Eve were saved. The Bible does not have a verse specifically devoted to that issue. However, I tend to believe from the context of the entire Bible that all those who brought forth the Messiah (the entire genealogy of the Messiah from Adam to Joseph) were saved, though they were sinful, they were forgiven for believing in the coming Messiah. They actually took part in that GREAT Course used as holy Godly vessels. All the Old Testament saints were saved in the same way. The Bible also mentions Abel was a prophet of God in Luke 11:50, Enoch walked with God, Noah was a righteous man … for this reason, I tend to believe the entire genealogy of the Messiah were saved. Again, thank you for this great blog and your very sincere and biblical replies. God bless your work in feeding His sheep! God bless Israel ! May Peace be in Jerusalem, the city of the Great King Messiah ! Thanks for blessing me. The Bible studies I have written, is also a faith walk for me. I am an investigate journalist by profession. I like to take deep dives into the scriptures. I know Jesus loves the multitudes of questions, I ask Him. I only take His answers at face value. As all Christians do, I make mistakes. There are certain issues I need guidance on. Thank you for correcting me in love. All the Old Testament saints were saved in the same way. This is a topic for a full Bible study. The Old testament saints were saved by the blood sacrifice made in the two Temples in Jerusalem. The Torah, and the letter to the Hebrews, made it perfectly clear. Without sacrifice of blood, there is no remission for sins. These offerings in the Temples of Jerusalem came up as an aroma before the throne of God, and sins were forgiven. These blood offerings were not perfect, and only a fragment of the perfection that was to come. When the Messiah came to Jerusalem, in the fulness of time, walking in flesh on Earth, He paid the prefect atonement for sins. He alone. He put an end to all kinds of blood sacrifices. The blood of bulls, lambs and other animals can no longer take away the guilt of sins. The Messiah paid with His own blood, for the sins of the whole World. Amen. The above listed is the reason I said: “All the Old Testament saints were saved in the same way.” They were saved by FAITH, not by works (e.g. sacrifices, keeping the Sabbath, avoiding certain food, etc.). All the required “works” of the OT saints are the pictures of the coming Messiah, by which the Jews might recognize their KING when He did arrive. As we have witnessed, some recognized Him and followed Him into His Kingdom, some failed and died in their own sin. I love Israel and the Jews. As a gentile member of the Church of Christ, the Bride of the Jewish Messiah, I know I will be married into the House of Israel 😀 I love the House of my Bridegroom. Israel is God’s anointed nation, God’s chosen wife; though she is sinful, I love her, as God loved me when I was still an enemy of God, and He came down from Heaven to take away my sin, He did not forget to put my little name in His Book of Life before the foundation of the world! The God of Israel is Love. God bless Israel. God be with all His chosen ones. killed an animal and clothed them. I believe that God made an animal sacrifice for Adam and Eve. I believe that this is why Abel knew to bring an animal for a sacrifice. It was because they knew that God justly rejected the sacrifice Cain. This verse says to me the Cherubims were not to block the way, but God in spite of man’s sin was keeping the way of life open. People knew there was a God. They had too many Gods. It wasn’t until the Psalms that it was said..’the fool has said in his heart there is no God’. The 10 commandments did not say believe in God, but to have one God. about the coming Son of God. So I think that Adam and Eve were saved, but they did not do a good job of raising their children in the Lord. I imagine life was very hard for them and they just did not teach strong enough. Many of us have had that problem with our children. I don’t know why Baptist children seem to leave the church with not much worry, but the Catholics are always there. It is a small mystery to me, but yet in my heart I know it is because we didn’t teach strong enough. Catholic children stay in RCC as adults because they are taught very early on that RCC is the original Christian church founded by Jesus, that it has the fullness of revealed truth, that the bread is Jesus Himself & if you leave RCC, you will go to hell. To leave RCC, is equal to leaving a cult. So I think that Adam and Eve were saved, but they did not do a good job of raising their children in the Lord. What we “think” is of some value. But I have learned to be silent where the Bible is silent. If not, products of human thinking starts to rule my life. There are many topics, that the Holy Spirit has left open. Jesus told Daniel the prophet, that there are things that are not disclosed to humans. We are not supposed to become like “god” before we enter the Kingdom of Heaven, and eat of the tree of knowledge. I will give you an example: Where was Joseph, the stepfather of Jesus, when Jesus died on the cross? The Bible is silent. And we should tell people that the Bible is silent, and not try to distribute our own wisdom. Another topic, is what happened to Miriam, the mother of Jesus? But the Roman Catholic Church made a whole new gospel, about how she ended her Earthly life. That she also ascended into Heaven, like her Son. Taken up to Heaven in body and soul, a co-redeemer. The very “Queen of Heaven”. This kind of “super revelations” became Catholic dogma in 1950, and Catholics who do not believe this are told that “Hell” is waiting for them. The truth is that Hell is waiting for all who believe this kind of doctrines taught by demons. Because it makes a mockery out of the true Biblical faith. I have enjoyed this Study including all they that had something to contribute. What intrigued me the most was Enoch. The Testimony of his life was he “walked with God”. “Then Enoch was not for he pleased God.” Am I right at this assumption? What I noticed was Enoch was the 7th generation from the first man Adam and I’ve often pondered if they were any coalition between saying the 7th church from the Last Man Adam? Like a type and shadow type of thing??? It`s not correct to call anyone a false teacher, who teaches prolonging our earthly life. Psalm 91:16 quote: with long life will I satisfy him, and show him my salvation. I really like this post. Interesting thoughts. Personally, I wouldn’t want to live 900 years. You are going to live eternally. What i guess you are trying to say, you would not like to walk in this fallen world for longer than it takes. I would like to go home to Heaven, at any time. But I feel Jesus still has something He wants me to do on Earth, together with the Holy Spirit, His representative who live and reign inside my heart.